This guide will tell you how to create a new team space. Start from visiting https://www.chanty.com/signup/ in your web browser. Then, follow the steps in the interactive signup. 1. Type Your work email and Your name, then click Continue to proceed to the next step. 2. 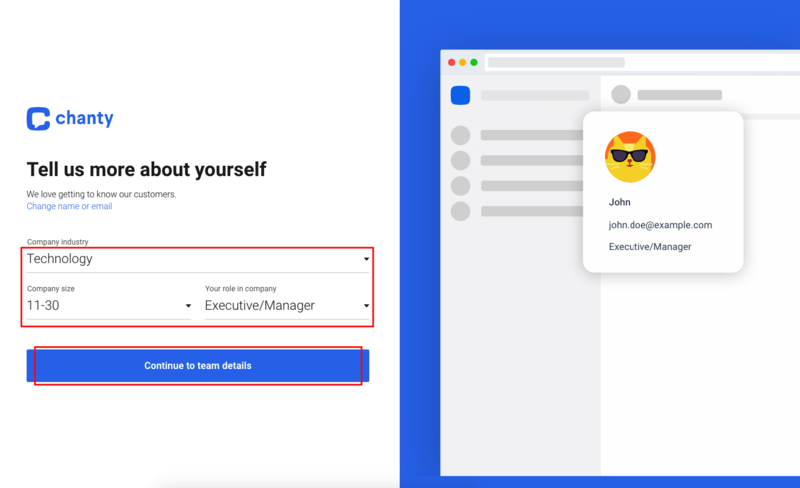 Pick the best option for Company industry, Company size and Your role in company to help us personalize your experience. 3. Choose the Team name and Team space URL link fields. Team name will be displayed in the top left corner of the app. Team space URL link will be used to sign in to Chanty. 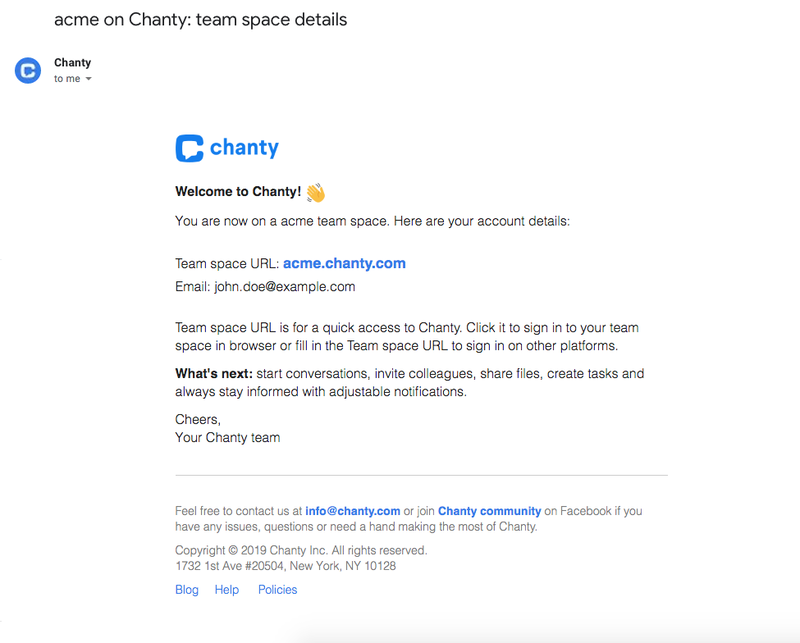 Note: Please choose your URL wisely, you won’t be able to change Team space URL once the team space is created. 4. 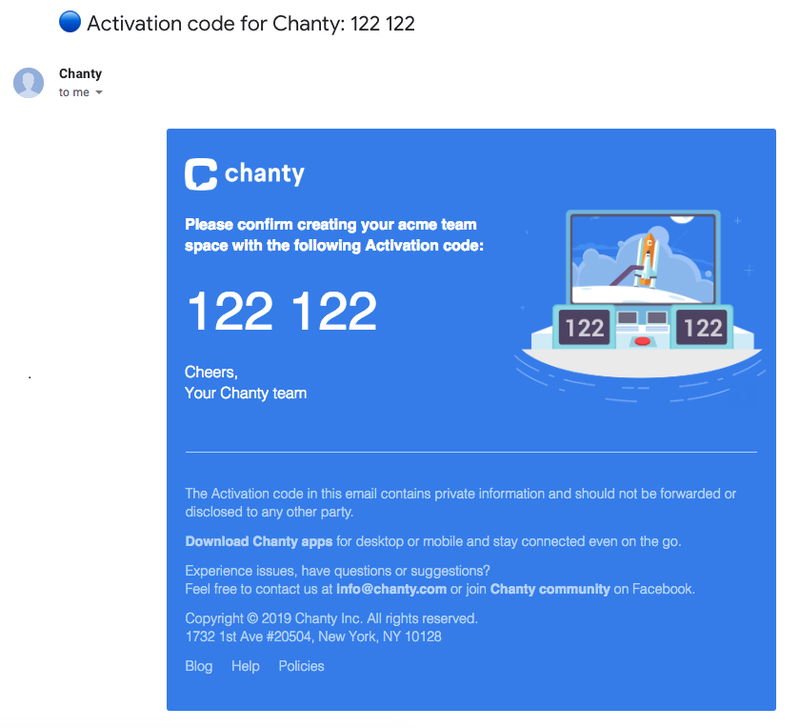 Open your work email Inbox for an email with Activation code from Chanty. Note: in case you didn’t receive that blue email with activation code from Chanty, or the code did not work for some reason, click Resend code. You can click Resend code only once in every three minutes. After a successful registration you will receive the Team space details email. It will include your Team space URL and the Email used at creating the team space. That’s it, you can enjoy using Chanty! Learn what to do next with our Getting started guide.